1850–1810 million years ago, the current rocky surface of southern Finland was at a depth of 18 kilometres. The temperature of the rock varied between 700 – 800 °C. In these conditions, where rock is highly metamorphic, a lot of changes took place in the rock. This was the peak of the metamorphic stage, and affected all rocks that were older than this. Rock species that had been stable in lower temperature and pressure conditions started to form new minerals. Many of these changes happened in reactions which converted old minerals into new mixtures of other minerals. For instance, black biotite reacted with white quartz to form red granite and blue cordierite. Granite and cordierite are so-called metamorphic minerals, and are indicators for metamorphic processes in the rock. In southern Finland, they are found as parts of clay-based gneisses and migmatites. During the peak of the metamorphic stage, rocks also melted. The melting started with clay-based sedimentary rocks, which melted into granite magmas. The molten granite made veins in the host rock, forming veined gneiss and other migmatites. 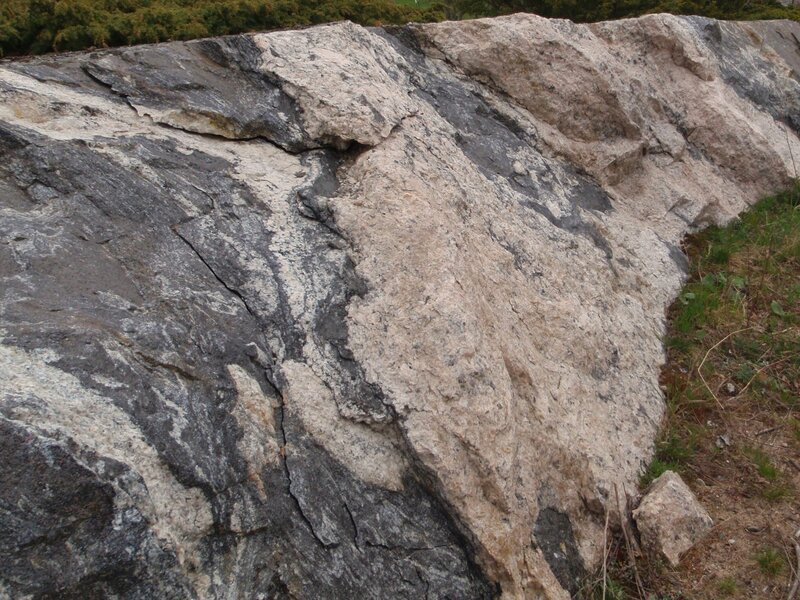 In southern Finland granites have formed due to complete or nearly complete melting. Most of the hills between Turku and Helsinki are made of this granite. The lower areas in between the hills are made of softer eroded rocks.